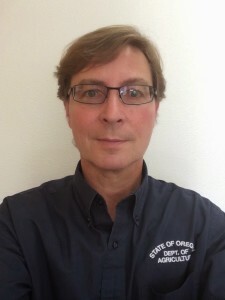 Dr. Helmuth Rogg (pictured) has been appointed the new director of the Oregon Department of Agriculture Plant Program Area. He replaces Dan Hilburn, who will retire at the end of October. Rogg has served as the manager of the ODA’s Insect Pest Prevention and Management Program since 2008, and was an entomologist with ODA for three years prior to that. He holds a doctorate in entomology and biocontrol from the University of Giessen in Germany, and a master of science from the University of Regensburg, also in Germany. Hilburn has served as Plant Division administrator since 1995. Prior to that he served as an ODA staff entomologist for five years. “I didn’t know anything about the nursery industry when I started, and it’s been a great education,” he said. OAN Executive Director Jeff Stone said that Hilburn has provided key leadership on the issue of plant pests and diseases. “He has been a tremendous partner and advocate for Oregon’s program to ship clean quality plants to domestic and international markets,” Stone said. But one that Rogg, as Hilburn’s successor, hopes to be able to match. “The challenges that we are facing are huge, and we can’t solve them alone,” Rogg said.